By request (S.L., this one’s for you! ), and because I had borrowed the Flip Ultra teeny camcorder from work, I have recorded and uploaded the first video of me playing a ukulele — specifically, the banjo uke I got from my dad for my birthday. This is quite an occasion, since I have barely even played the ukulele in front of anyone but K and family members. The video really shows how comfortable I am performing in front of a camera, I think – basically, not too comfortable at all. Click here to watch. UPDATE: This little uke has found a new home! Sold. I’m ready to release the first ukulele I bought out into the wild, along with enough accessories and good stuff to get some other beginner started. I plan to put the money from this sale toward the purchase of a cheapo baritone uke I’ve been reading good things about on the EZFolk forums. 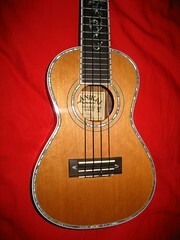 A Santa Rosa soprono uke (here’s an example). Not a bad little uke at all; especially when you put good strings on it. These seem to be the majority string of choice on every uke forum I’ve been to, although there are other good strings out there. These are about a million times better than the strings that came on this uke. Sound quality and volume are both really affected by the quality of the strings you use, and switching to Aquila strings is a notable upgrade for any cheap uke. – a metal strap button on the bottom, in case you find you want to use a strap that doesn’t hook into the sound hole. – A chromatic pitch pipe (it’s important to have the tools to tune your uke, but this one stays in tune; see below). – A Jumping Flea Collar Uke Strap (except that this one has a flame pattern, which is way hipper looking than any of these shown here, I don’t know why they discontinued it). – A felt pick. I haven’t use these much myself, but some people like them. You should try one just to hear how they sound. – A CD including PDF versions of uke chord charts and tips, plus hundreds of songs with chord diagrams for soprano ukuleles. This is really the most awesome part of this package. Why buy a cheap uke to start out? Basically, because it’s cheap, and playing a cheap uke is still a great experience. You could try to pick out your first really wonderful ukulele before you ever learn to play one, but, honestly, picking up a cheapo and learning that you really can play it gets you excited about the instrument and, if/when you choose to upgrade, you’ll have a better grasp on what you’re looking for when you shop. You won’t be relying just on a bunch of web reviews and forum posts; you’ll have your own experience as well. Plus, obviously, you’ll have more money in your pocket to spend, since you’re not blowing a bunch on your first uke. You’ll read that some cheap ukes won’t stay in tune, but this isn’t the case with this uke. It stays in tune for weeks, even months at a time. Anytime you put new strings on an instrument, you’re going to have trouble with it staying in tune for a while, but these strings have settled in and won’t give you that problem — and you won’t want to change out these any time soon, because they’ve been nicely upgraded. With this stuff and the help of beginner uke sites on the Web, you can be playing your uke within an hour of picking it up. There’s a ton of helpful sites out there, but I’ll list a few to get you started. However, if I was starting over again, I’d still buy a book. I had both “Mel Bay’s You Can Teach Yourself Uke” (I found a cheaper copy without a CD, which was fine) and “Jumpin’ Jim’s Ukulele Tips ‘N’ Tunes” both of which were a great help. Anyway, I spent about $70 accumulating the stuff I’m selling now for $35. I invite you to purchase it, learn to play and enjoy making music on it, then upgrade and send this one back out into the world for somebody else to learn on. Drop me a line if you’re interested. On Friday night my office had a party. 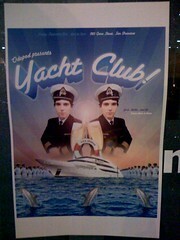 It’s theme was “Yacht Club.” I wore my terrycloth nautical flag shirt, and K. wore a perfect yacht club dress. On Saturday morning, thanks to that party, I didn’t feel so good. Thank heavens for prescription headache medicine. I made it to my 9:30 a.m. ukulele class, but just barely. K. went with me this afternoon to Yerba Buena Gardens, where they were having a ukulele festival, with lots of free music. 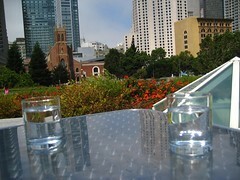 It was fun and pleasant to sit on the grass in the garden, but we were hungry, so we had lunch at Samovar. It was really lovely and pleasant, and we could hear the music, at least sort of, from our outdoor table. It seemed really nice inside, too. 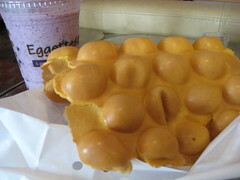 It was very relaxing and lovely. We left for a while, then I came back for the big finale, a performance by Jake Shimabukuro. He’s pretty darn impressive. Here’s a video so you can see what I mean. July is my birthday month, and the first day of my birthday month seemed like as good a day as any to buy myself a present, so now I’ve got a Lanikai custom series LCD-C concert-size ukulele. Of course, I took a bunch of pictures. I mentioned that I was attempting to learn the uke a few posts ago, and it’s not like I’ve become a great player or anything between then and now, but I decided it was time to upgrade from my $30 uke because I was having some pain in my thumb, I think from having to press so hard on the uke’s neck to play chords without buzzing. So, since a friend of K.’s has loaned us her car while she’s out of town, and K. is out of town too, I drove out to the East Bay this afternoon and test drove ukuleles. I had heard lots of good things about the Flukes and Fleas and I thought maybe that was the way I wanted to go, but it turns out I didn’t really like the way they sounded all that much. I also tried a K-Wave Les Paul style uke, but I wasn’t impressed with the sound enough to get me past the fact that it weighed a ton, more than other ukes with pickups I tried. I even played a Lanikai 6-string tenor uke, which had a nice deep tone, and was very neat sounding, but not exactly what I was looking for right now. There were two serious finalists: The Kiwaya KS-5, which I played at the 5th String (a very nice place even though I didn’t buy there), and the Lanikai, which I found at The Thin Man. I was pushed over the edge by the price (the Lanikai was at the top of my price range, and the Kiwaya was a little bit above the top) and the prettiness of the LCD-C. I’m also interested in trying the concert size, just to mix things up. 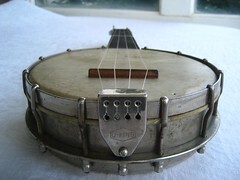 I actually was very intrigued by a vintage 30s-Era Royal Hawaiian Hotel-branded soprano uke at The Thin Man; it had an awesome loud sound, but I felt like it might be too fragile for my ungraceful paws. 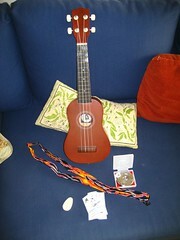 So, now I have the lovely Lanikai uke, which sounds great when I play “Amazing Grace” on it, my least hesitant number. I also got a bargain on a hard-sided case for it, and I optimistically bought a book on fingerpicking, thinking perhaps I’ll try to move past simply strumming. 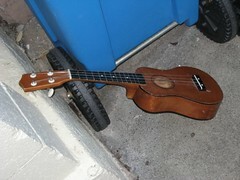 Don’t get me wrong — I won’t toss my little cheapo uke. It will be a fine traveler, and it sounds pretty good especially since I put good strings on it. Yeah, I still have the distressed uke I found on the street, and new strings helped it too … but maybe not enough. So, that’s my first birthday present. I’m also buying myself a nice new yellow motorcycle helmet, although I think maybe I’ll lump that in with scooter-related necessities in my budget and not call it a birthday present. 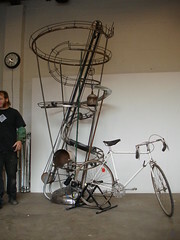 Although it’s pretty neat, too.